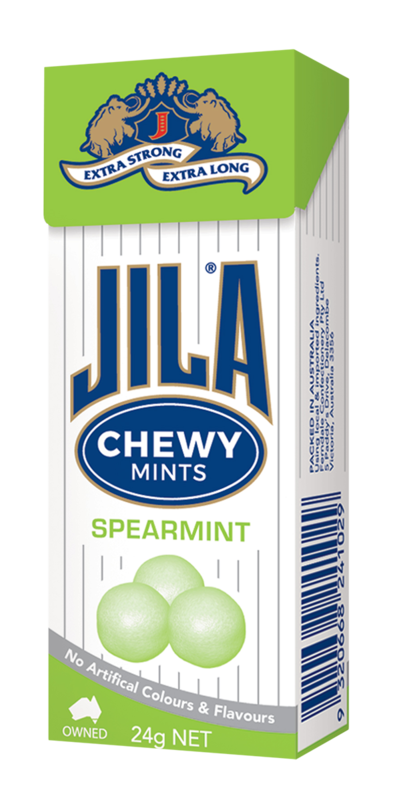 Refreshments from natural mint essence, and energy from glucose, make JILA CHEWY MINTS the ideal modern personal accompaniment in work and social situations. Sugar, Glucose Syrup [Contains Preservative (E220)], Vegetable Oil, Gelling Agents, (E440, E406), Natural Spearmint Flavour, Emulsifier (E322 From Soy), Glazing Agent (E903), Plant Concentrate. Sugar, Glucose Syrup [Contains Preservative (E220)], Vegetable Oil, Gelling Agents, (E440, E406), Natural Peppermint Flavour, Emulsifier (E322 From Soy), Glazing Agent (E903), Sweetened Plant Concentrate.